This is Victoria Calvin with Victoria Marie Designs! I am so excited to be one of the guest designers for the Inktoberfest 2018 event with The Hedgehog Hollow and Tonic Studios. 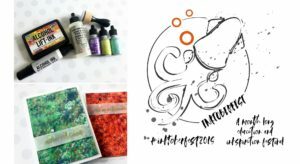 Today, I am going to share a few of my thoughts about the Tim Holtz Alcohol Ink line of products. Also, at the end of this post is a link to a YouTube video where I demonstrate three awesome techniques using some of these products. I have been curious about Alcohol Inks for a while, passing them over many times at my local craft and hobby store. Until one day, I caved and purchased four sets of inks! Needless to say, I was HOOKED! 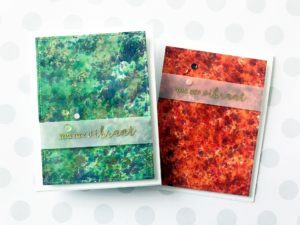 I have used alcohol inks to make card bases, on art journal spreads, and on scrapbook layouts. Alcohol Inks are incredibly versatile and can be used on a variety of substrates to include Yupo paper, glossy card stock, metals, canvas, tile, and much more. This ink is highly concentrated so it goes a long way, and works best when blended with other alcohol inks. 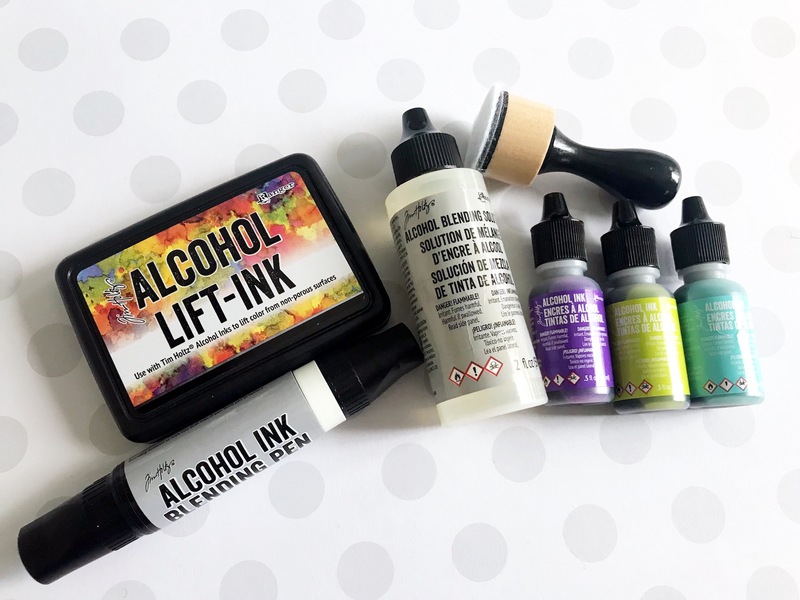 The design possibilities are endless – you can use alcohol ink on its own or with a blending applicator, a blending pen, stencils, and a host of other tools. Also, Alcohol Inks are fast drying and can be used with Alcohol Blending Solution – this allows the ink to move fluidly across a substrate. 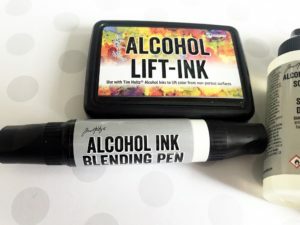 The line of Alcohol Inks and related products also includes the Alcohol Lift Pad. This pad is designed to lift alcohol ink from non-porous surfaces such as Yupo Paper. The pad itself is made of linen and contains clear ink. Just apply the ink to a stamp (rubber, acrylic, cling), press the stamp to a non-porous surface, dab the excess ink with a clean paper towel, and buff away the remaining ink to reveal the stamped image. This same technique can also be achieved using the Alcohol Ink Blending Pen. The Alcohol Ink Blending Pen has two nibs (thin and brush) and can be used for lifting ink from a non-porous surface. The pen barrel does not come with ink, however, simply remove one of the nibs and pour Alcohol Blending Solution into the pen barrel. Also included in the line of alcohol ink products is the Alcohol Ink Blending Mini Applicator. This applicator looks a lot like the Distress Ink Blending Tool, (because it is) however, the foam applicator is replaced with a mini felt applicator. Alcohol ink can be applied to the mini felt applicator and used to create interesting designs on any project by dabbing or spreading the alcohol ink over a surface. 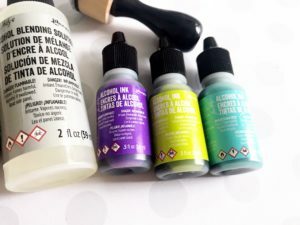 Alcohol Ink Blending Solution can be applied to the mini applicator as well. Here are two examples that I created using an Alcohol Ink Mini Felt Applicator and Alcohol Ink. To see these cards come together, scroll down. Alcohol Inks are super easy to use and the design possibilities are endless! These inks are very pigmented, come in a variety of colors, and can be used on a ton of projects. Also, I like the that Alcohol Inks can be applied to several substrates, making this product extremely versatile. To see these products in action, check out my YouTube video where I demonstrate how to use these products and create two fun alcohol ink cards. Also, for TODAY ONLY, save 20% off all Tim Holtz tools at Tonic (excludes glass mat and paper trimmers). Use coupon code TOOLS20 at check out, click here to view the selection and remember to shop early for the best selection! Offer valid noon EST 10/6 – noon EST 10/7 not valid on previous orders. Also we now have a bonus coupon for 10% off at Ellen Hutson; use code inktober18 for 10% off everything in the store (except the BCRF set & Mama Elephant new in the last 90 days). The code is valid until 10/31. Click here to hop on over to her store and save! !